Stoke deservedly beat Manchester United on home soil with two more goals from in-form Charlie Adam doing the damage.United started slowly, Jonathan Walters almost getting on the end of a ball that cut through the middle of the United defence. Any attempt at momentum from the visitors was interrupted by an early injury to Jonny Evans, who limped off to be replaced by Rafael. There were glimpses of class from United, Wayne Rooney's half-volley fizzing past the post before an uncharacteristically weak free kick from Juan Mata, and it was slightly against the run of play when Stoke took the lead. 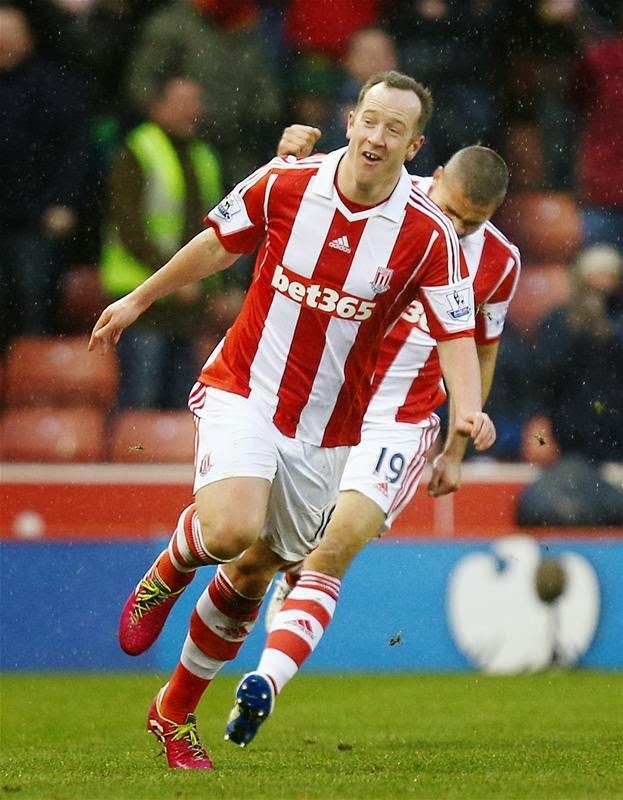 Charlie Adam took a free kick for Stoke and, despite standing 40 yards from goal, opted to take on the shot. His effort took a wicked deflection and whizzed past the static David de Gea. Moments later, United's afternoon got even worse as Phil Jones had to be stretchered off with a head injury. Minutes after the second half started, it looked like the United comeback was on when Robin van Persie tapped the ball past Asmir Begovic after some clever build-up play from Mata, but only five minutes later Stoke were back in the lead. It was Adam again who gave Stoke the lead, fizzing the ball into the top corner from 25 yards after a cushioned header from Walters. With Stoke leading it was left to United to mount some sort of resurgence, but they left it until the final few minutes of injury time. First Ashley Young made a mess of a free header in the box after a pinpoint cross from the wing from Chris Smalling, before Rooney's free kick was tipped onto the bar by Begovic. Ultimately Stoke made the most of an off day from United, to haul themselves into mid-table mediocrity and leave the visitors today with yet another huge dent in their hopes of finishing in the top four.